beautiful views . . .
SKYBURRIOWE FARMHOUSE offered B&B stays set in a leafy no through road on the outskirts of Mawgan village on the Lizard Peninsula. 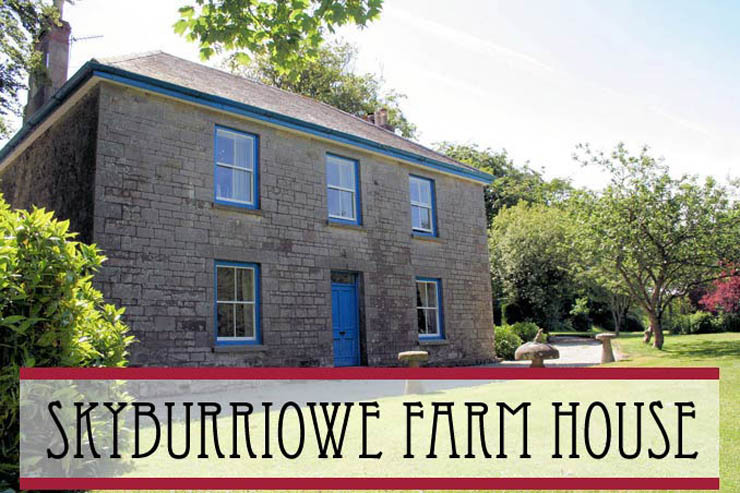 Skyburriowe farmhouse advertised B&B stays on the Lizard Peninsula on these pages from May 2005 until May 2017, when the owners notified us that they had decided to retire from B&B. Skyburriowe farmhouse is set on a working dairy farm whose owners are true Cornish and has been in the family for generations. Skyburriowe farmhouse is approximately 120 years old and boasts original stained glass arched landing window and porch door. 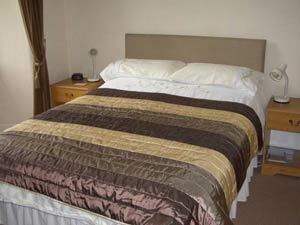 Skyburriowe farmhouse offered spacious well furnished en-suite rooms, complete with tea/coffee making facilities, colour TVs , hairdryers, alarm clocks and central heating radiators. 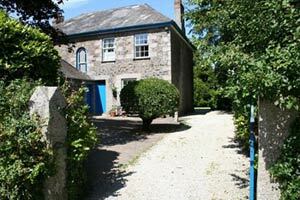 Each bedroom at Skyburriowe farmhouse B&B overlooked the spacious lawned garden. Skyburriowe farmhouse B&B was ideal for those who enjoyed walking - with many public footpaths that crossed the farm, as well as the stunning coastal footpaths. Skyburriowe farmhouse was ideal for Beach lovers - a 10 minute drive in any direction in search of one of the many secluded coves and sandy beaches, Kynance, Poldhu and Gunwalloe to name a few. Located at Mawgan on the Lizard Peninsula, Skyburriowe farmhouse B&B was ideally situated for touring West Cornwall's gardens, beaches towns and coastline. The Lizard is one of the last remaining absolutely unspoilt areas of the South West. Small fishing villages nestle into the rugged coastline and the central moorlands are home to countless rare birds and plants. The coves with their sandy beaches and rock pools are perfect for summer days, and winter walks. Helston (The gateway to the Lizard Peninsula) is one of the prettiest market towns in Cornwall, with cobbled streets and alley's and a variety of little shops, restaurants and pubs. Famous for the ''Flora Day'' in May each year, Helston has retained a strong sense of tradition and history. From Penrose Park, at the bottom of the town, you can walk through beautiful woodland along the edge of Loe Pool, which is the largest natural freshwater lake in Cornwall. 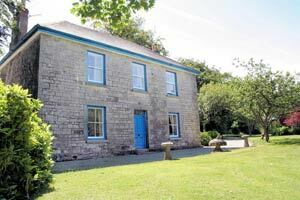 This walk also takes you to Loe Bar, the sandbank that separates the pool from the sea. The Lizard is well known for its collection of picturesque coves and bays, from the awe inspiring beauty of Kynance Cove on the western coast to The Lizard itself - Britains most southerly tip. The popular holiday hotspots of St. Ives, Penzance, Lands End, Truro and Falmouth are all within a forty minute drive away. The famous Eden project is approximately one hour's drive away, but well worth the visit; but there are many spectacular gardens in the local area; including Trebah and Glendurgan on the eastern fringes of the Peninsula.